I certainly will be there, wow, back to the 70’s Chic style, except it’s 2015 and Nile Rodgers is super star again following his escapades with contemporary artists. The Disco legend has the golden Disco touch, sounding like this was on an old Chic LP from ’79. 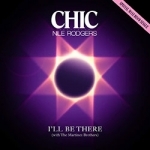 Paying tribute to the disco era the song makes references to Chic-related songs and artists produced by the group. Subtle samples from Everybody Dance and Goodtimes. Will be playing this all summer long.